The American, Arthur Ashkin of Bell Laboratories in New Jersey, entered the record books of the Nobel Prizes by becoming the oldest laureate at age 96. Donna Strickland, of the University of Waterloo in Canada, became the first woman to win a Nobel in three years and is only the third to have won the prize for physics. Frenchman Gerard Mourou of the Ecole Polytechnique and University of Michigan will share half of the 9 million kronor ($1.01 million) the prize carries with Strickland; Ashkin gets the other half. “Obviously, we need to celebrate women physicists because we’re out there. And hopefully in time, it’ll start to move forward at a faster rate, maybe,” Strickland said in a phone call with the academy after the prize announcement. 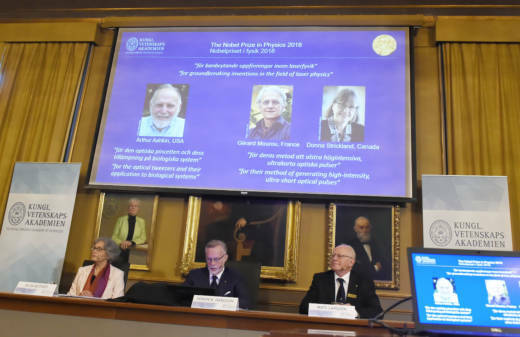 “It is also a personal delight to see Dr. Strickland break the 55-year hiatus since a woman has been awarded a Nobel Prize in physics, making this year’s award all the more historic,” Moloney said. The winner or winners of the Nobel chemistry prize will be announced Wednesday, followed by the peace prize on Friday. The economics prize, which is not technically a Nobel, will be announced Oct. 8. Heintz reported from Moscow. Malcolm Ritter in New York, Samuel Petrequin in Paris and Frank Jordans in Berlin contributed.